This picture of Yoxi was sent in by Phil Martin of New Hampshire. He was in Aubuchon Hardware in Center Harbor, New Hampshire one day, and captured this shot of Yoxi in her nest. She was born in 1996, and came to the hardware store in late autumn of 1997. She was picked up from a local animal shelter. Yoxi was named because of her color. If you mix paint with the code YOX, you get the color of her fur. She likes to sleep all day, but if she hears a child come in she wakes up and follows him around. 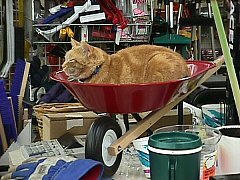 Phil wrote in his letter to me "Let your viewers decide whether it's a big cat or a small wheelbarrow. " *Note: Yoxi died in August of 1998. He was hit by a car outside the hardware store where he lived. He will be missed dearly.